Choose this restaurant theme in light pastel colors with coral hues if you want your designs answer the latest design trends. 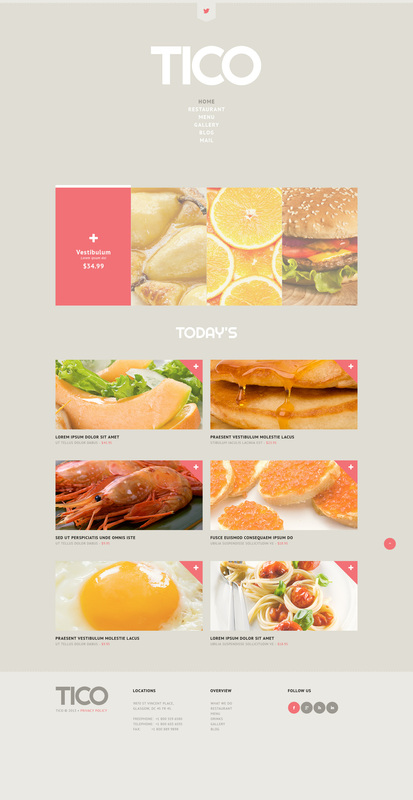 This theme is good for a variety of cafe and restaurant sites that feature great amount information and need a good presentation of their portfolio. Huge header draws attention to the companyÃ¢â‚¬â„¢s idea, vertical menu in the central position guides visitors all around the site. The Ã¢â‚¬Ëœwrapper elementÃ¢â‚¬â„¢ in the top looks attractive and reveals the top items. The blocks of Ã¢â‚¬Å“todayÃ¢â‚¬â„¢s offersÃ¢â‚¬Â are presented with sappy images and welcome the viewers to taste them. Take just few minutes to make a whole functional web. Well done!